Join us for any of the interactive professional learning programs listed below to expand your content knowledge and enrich your use of primary sources in the classroom! 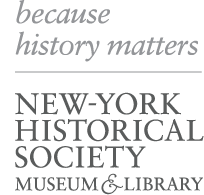 The New-York Historical Society is an NYSED-approved CTLE sponsor, and participation in workshops is applicable towards maintaining professional certification from the New York City Department of Education. All “Pizza & PD” and “Think & Drink with a Historian” sessions are FREE to teachers whose students participate in our Social Studies Enrichment, Art of History, or History on Broadway programs.